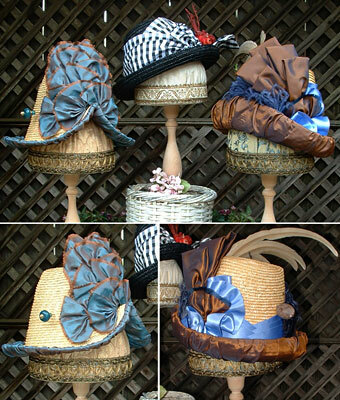 Hats in Victorian times were primarily used for protection from the sun and to avoid getting injured. However, in the later years, the hats became a symbol of authority and style statement – somewhat a “show off”. Women and men wore a different kind of hat. In the 1860s, the main headwear for women was the bonnet. The bonnets properly framed a woman’s face. The sunbonnet was made from different fabrics and it protected their face and neck. Young women and girls of the Victorian period also used hats. Most of the hats used were trimmed with ribbons, flowers and at times, veils. Hats were an essential part of a woman’s apparel. They would always wear a hat when they went out for social events. The hats were typically layered on a wire base covered with straw braids. Sometimes, instead of straw braids, it used twisted fabric and was made from velvet, satin, cotton and tulle fabrics. Decorating piece on the hats were birds and this was in vogue in the last half of the 19th century. The hats were ornamented by bird parts like their wings, breasts or sometimes the whole bird was used. The Brazilian blackbird was in demand for becoming a showpiece on the hat. Hats also include hatpins which were either the basic hatpins, or stick pins, or cameo hatpins or even novelty hatpins. Hatpin holders may be classified into boot hair pin holder or tall hair pin holder. One of the most romantic looking hat of the 1850s was a leghorn straw with a wide brim dipped down at the back and slightly at the front. In the early 20th century, hats had wider-brim and were worn high on the head. For a formal day and evening wear, men typically wore a top hat or the tall silk hat. A light grey top hat was popularly worn in the 1860s mainly for racing parties. Since the 1870s, there was some change in the trend. The number of hats that were considered appropriate for informal wear were on the rise. The wide-awake, a broad-brimmed felt hat with a low crown was popular as a countryman’s hat. Victorian men also wore caps which were of firmly woven wool and had a close-fitting.